Summer is upon us and we have New releases to add to the heat. Sophie is in big demand, we have more Sophie now available conveniently in episodic form. New Season 3 - Episodes 1 released now, followed by New episodes to be released each week. All episodes priced individually, each approximately 30 minutes in length. and each episode is Hotter and More Explicit. Sophie is sure to cause a Temperature rise this summer! For those who bought Sophie, we have sent you a special email to enjoy further savings, be sure to check your email inbox or spam or bulk mailbox folders. We are off to the studio on production shooting now 2 more feature length films. Be sure to check your Email for News on Boundheat.com's Upcoming Super Summer Savings DVD Sale. All DVD will be on Sale This Summer as PreOrders!! Our office staff will be away the next few weeks but we will be checking email remotely. Please do allow a couple of extra days for replies. 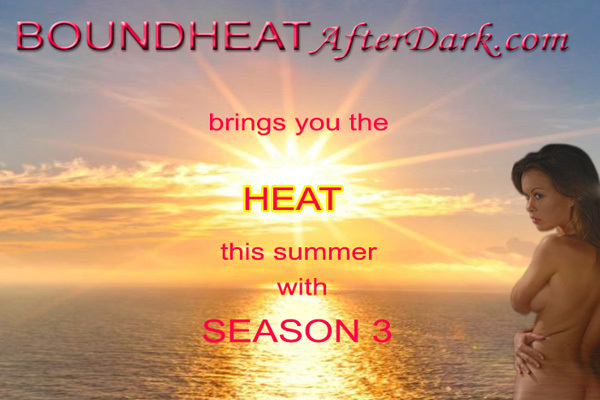 All of us at Boundheat and BoundheatAfterDark wish you a wonderful summer!